If you are looking for a scenic and secluded mountain getaway, then look no further! Wolf Mountain Hideaway is the perfect cabin for you! Ideally located in the Stewart Mountain area and within a few miles of world-class fly fishing, kayaking and tubing on the Toccoa River at nearby Horseshoe Park . 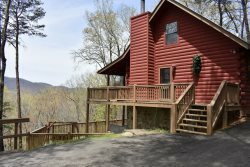 Just 15 minutes North of Downtown Blue Ridge, 30 minutes to Harrah’s Casino and within minutes from hiking trails, this cabin is the ideal place for family and friends. Tucked away within a wooded hillside log cabin community, with paved roads and driveway, this cabin has an open PROW front design, with a large, flat grass yard for kids and small dogs to run and play. The cabin has a traditional log cabin exterior and warm pine interior that relaxes your body and mind. A distinctive wood burning fireplace under a covered the front porch will keep you warm as you stretch out on the comfy cushioned patio furniture. The main level is open and airy with a large dining room table and fully-equipped kitchen with granite counter tops, and all the kitchen amenities and accessories needed to bake homemade apple pies from Nearby Blue Ridge Apple Farms. The custom made Poplar Bark wooden cabinets are warm and unique , inviting you in for a closer look. The rustic wildlife-themed décor throughout the cabin continues on the spacious 360 degree wrap around deck, where you can take in stunning mountain views or secluded wooded hillside, depending on the side of the house you sit on. Enjoy a glass of wine or an ice cold beer, while grilling on either the Weber Gas Grill or the Smoker/Charcoal grill, while friends and family can sit back and relax on the homemade wooden chairs that overlook the mountain side. Step on down to the lower level into the game room and engage in some friendly competition of foosball , or go old school and play Pac Man, Donkey Kong and 58 other games on the modern, yet retro Video Arcade Cocktail-Table. If traveling to the local casino isn’t your thing, then play a game of poker with your friends on the large custom poker table that also transforms to a dining or gaming table. Entertain your friends and family with cocktails at the custom built wet bar, with Poplar Bark wooden cabinets , with its own sink and built in fridge, perfect for home entertaining. If entertaining isn’t in your cards, then sit back and relax while watching high-def, surround sound on a 70 inch, Sony Aquos TV. When you are ready to settle down for the night, choose from the upper level master suite with king bed, matching wooden furnishings, flat screen TV, and folding shutters that are both overlooking the living room and outside mountain views. The master bathroom is equipped with double vanity, Jetted -Jacuzzi tub and separate shower. The lower level bedroom has a king log bed, matching log style furnishings, flat screen TV and across the hall is a full shower and bath. Whether you are here to entertain guests, sit by the outside covered fireplace or firepit, relax in the hot tub and watch the sunset over the mountains, or just want to spend quality time with family, Wolf Mountain Hideaway has it all. HOT TUB – 6 person with 29 Jets, Ozone LED Color Waterfall, Dual Side controls and 6 beverage holders. OUTDOORS – Main level wrap around deck, with outdoor covered fireplace and ground fire pit, with plenty of seating. WEBER Gas Grill and a Smoker/Charcoal grill. INTERIOR – Tongue and groove, warm pine floors and walls, ceiling fans, 2 remote controlled fireplaces. KITCHEN – Fully equipped main level kitchen, stainless steel appliances, granite countertops, poplar wood cabinets, kitchen utensils, microwave, toaster, coffeemaker, coffee grinder, filtered water. DINING ROOM – Large dining table, seats 8. FAMILY ROOM – Leather chair and ottoman, large couch with coffee table and 2 side tables and matching chair and ottoman, Remote controlled Fireplace w/ great view of the mountains. BEDROOMS – Upper level master bedroom: king bed, 2 side tables and lamps, western style armoire / dresser with Flat Screen TV and Direct TV, doors open overlooking family room or out to the mountain. Main level master bedroom: king bed, 2 side tables, dresser, closet with plenty of shelves, Flat Screen TV and Direct TV Lower level bedrooms: Queen Bed with 2 side tables and dresser and 2nd bedroom with full size bed and twin size bunks with side table and closet. AMENITIES – Hot Tub, game room, log porch swing, and a large level grassed lawn for kids or small dogs to run and play. I loved this cabin and will be back soon!! Everything was amazing. I did not want to leave. Everything was clean and as expected, I will be coming back and recommending to everyone I know! !